Many years back when I was still working in Asia, I had a colleague who is a very dedicated Buddhist, it was him who brought me into the Buddha's light association and later on to the Guan Yin (Avalokitesuarn) foundation where I plunged in to volunteering outside my work. Volunteering was one of the best memories of my young age, the joy of doing something for others and for bigger reason than just oneself is beyond description. Something that I have full intention to continue whenever chances come by. So come back to my ex-colleage, he then married one of our fellow volunteers and had a very nice vegetarian wedding reception. 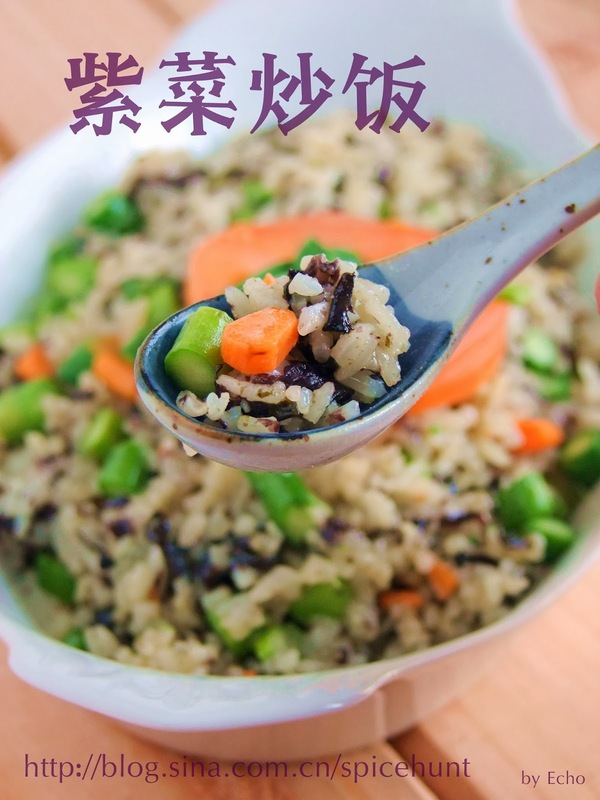 It was in that reception that I first tried this seaweed fried rice, the taste and image of it stays in my mind for so many years. A few days back when I was clearing up my pantry, I saw a packet of Japanese roasted seaweed that I bought for Baby A as snack, he wasn't too crazy about it and refused after a few attempts. 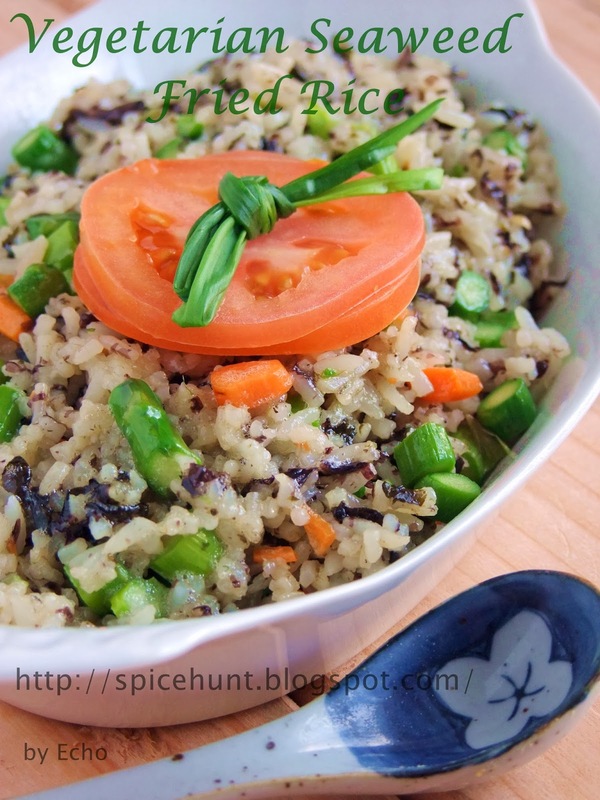 Since I had some left over rice in the fridge, I made this fried rice with a little extra Chinese seaweed. It turned out just the way I remembered. 1. In a cooking pan/wok, heat up 2 tbsp of cooking oil. Stir in minced garlic, cook until fragrant. Add the rice in and use a spatula to keep breaking the rice until loosen. 2. 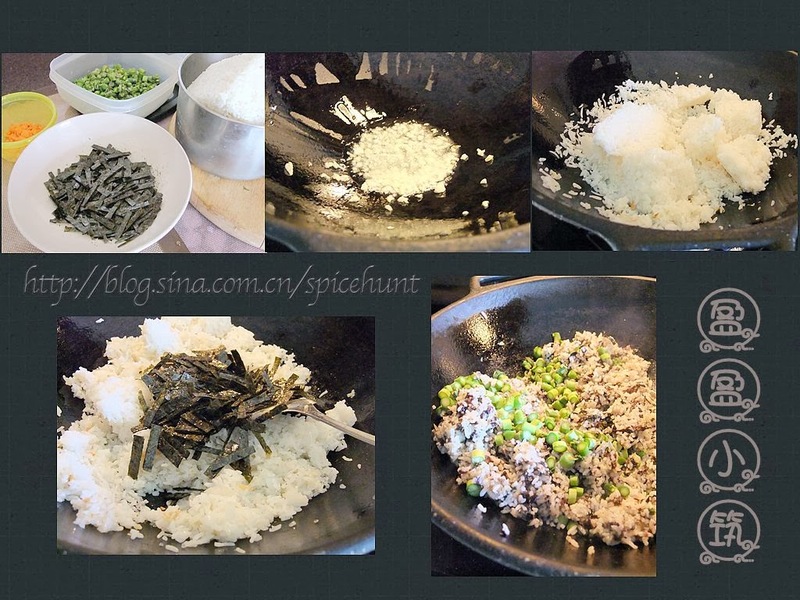 Add the shredded seaweed, season with salt and keep stirring until some of the rice at the edge bouncing a little (my grandma's way of deciding if the fried rice is well done.). Add chopped vegetables and continue cooking for 5 minutes. Add a few drops of sesame to enhance the smell and taste. Very good vegetarian dish indeed!